The most hostile venue in sport Adam Treloar and Mark Allen take to the microphone in episode five of Collingwood Media's new vodcast to discuss the toughest and most intimidating road trips in sport. He was one of the most talked about players during last years NBA Finals, but basketballer Matthew Dellavedova is still a Collingwood fan at heart. Often referred to as just ‘Delly’, the guard has become a pivotal part of the Cleveland Cavaliers backcourt. He calls LeBron James a teammate, plays in front of sold-out stadiums and travels the United States in private jets for a living. Yet despite dealing with a strong time difference, the Maryborough-born Dellavedova still finds time to track the progress of his beloved Magpies. “It’s pretty tough, but I can always watch a replay or try to watch a quarter or two where I can,” he told Collingwood Media. “I remember watching the Grand Final in our locker room at college, when Collingwood was in the 2010 replay. “Luckily we had a few Aussies on the team at St Mary’s. “They were Queenslanders, so I was trying to convert them to Collingwood supporters as well. Despite his best efforts, explaining the concept of Australian Rules to his teammates hasn’t been easy. “The first question is always, ‘Is it Rugby?’...And it’s obviously not rugby. Then just trying to explain the scoring and how you kick the ball to your teammates and things like that, it’s a little bit different. Dellavedova is known for his grit, determination and team-first attitude – qualities he proudly attributes to learning from Premiership Magpie, and now Collingwood Life Member Nick Maxwell. “He’s someone that I’ve followed pretty closely, just the way he goes about his game,” Dellavedova said. “His team first attitude and his desperation for the ball, how he wasn’t highly touted and had to come through the rookie list and fight his way onto the team to get a spot. 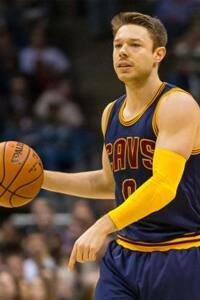 Dellavedova went undrafted in 2013, before signing with the Cavaliers for the 2013 NBA Summer League. His hard work paid off, starring on the international stage just two years later in the 2015 NBA Finals series, following an injury to starting point guard Kyrie Irving. Collingwood players sent a message of support during the series, with former Vic Country basketball teammates Scott Pendlebury and Nathan Brown in particular wishing the Cavalier good luck. “That was really cool that they took the time to send out a video,” Dellavedova said. GOOD LUCK DELLY - Watch the video the Magpies sent Dellavedova before the 2015 NBA Finals.